Good Afternoon! Another beautiful one here in RBNY Land. The Red Bulls are back in action today (against the Revs) in a must-win game before a brutal 4 game road trip. 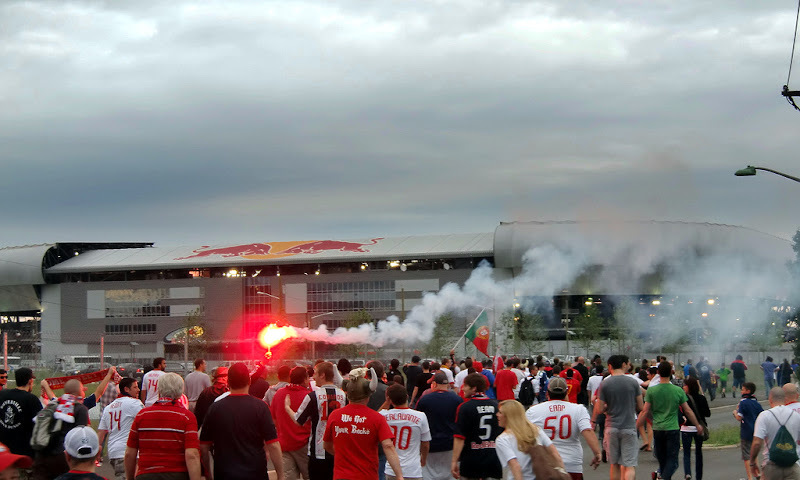 Before tonight's game, however, let's examine some of the RBNY related happenings of the past week. Joel Lindpere to Leicester City? According to this article from the UK's Daily Mail, the English club, currently playing in the Football League Championship (2nd division), is interested in the Estonian midfielder. Thankfully for us, Lindpere quickly denied such a move. A German trialist with RBNY? This little blurb, by Kristian Dyer on twitter, indicated that an unidentified player would be coming on trial with our team. Then this tweet, from the team's feed, indicated that the trialist would be from Germany and is "at the top of his game". We'll know who it is this coming Monday. Any guesses? The Red Bulls will honor recently retired midfielder Seth Stammler before at half-time of today's game. I want to see everyone in the South Ward hold up one shoe in honor of RBNY's long time utility man & great humanitarian. Please click here to see a Stammler highlight reel. From Merseyside to Secaucus: here's another profile of RBNY midfielder John Rooney. Might the "Best Rooney Ever" get his chance tonight? Finally, the Red Bull are partnering with the Kicking + Screening Film Fest. This will the the 3rd installment of K + S.